Fibre-reinforced plastics (FRP) consist of a matrix structure (e.g. 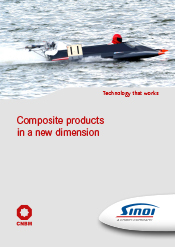 polyester or epoxy resin) and glass fibres joined into a fibre-composite-structure. This material is especially shock-resistant, rigid, tensile and also chemical-resistant and weather-proof. Moreover, it is characterised by low weight and takes almost every possible shape. In combination with reinforcing materials, such as PVC foam and balsa wood, components considered to be static and dynamically highly resilient can be produced in the so-called sandwich design. These days fibre-reinforced plastics have a wide range of applications. They are are indispensable materials used in industries such as power generation, vehicle construction, mechanical engineering, boat building, aircraft construction and many other fields.